“The Captain’s AMERICA” radio show…Captain Matt Bruce is an American, Conservative, Independent, Patriotic voice for freedom emanating from the Tampa Bay area. A veteran soldier and fire-fighter, ‘The Captain’ approaches news and events both nationally and locally as an American first – period! Democrats, Republicans and Independents are all welcome to join the conversation – because it’s all about the “we” and not the “me” on the radio show. Heard LIVE Monday thru Friday overnights from 2-6 AM ET broadcasting from his Flagship Radio Station AM 860 WGUL in Tampa, FL. all across America. 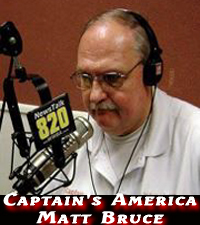 Saturday early 2-5 AM ET with his weekend edition LIVE of “The Captain’s AMERICA – Third Watch” radio show. Tune in, call the show 1-877-969-8600. God Bless America…..